Simple, logical design. 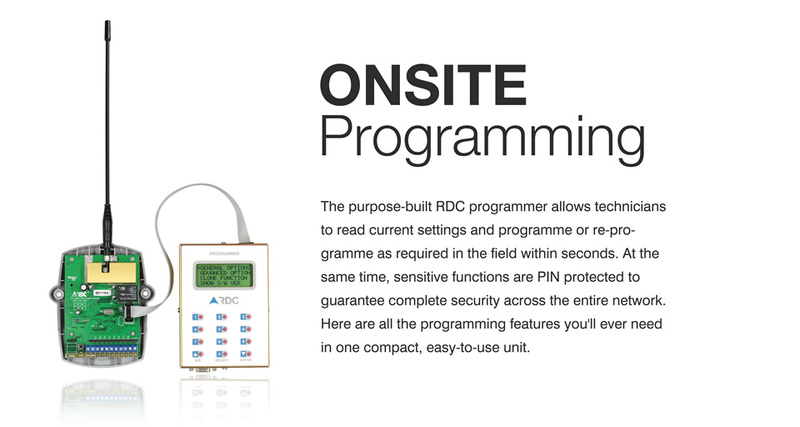 The new RDC programmer has a 16 x 4 character line display and a 12-button keypad with continuous scrolling English text help. Inside, there's a flash upgradeable microprocessor, which allows for programmer software updates without opening the programmer. Easily portable and requiring no separate power source. Power for the programmer is supplied entirely through the programming interface. No need for batteries or mains. Instant viewing of current configuration. No more guessing or unnecessary reprogramming. The settings of the transmitter can be checked, and left unchanged or modified as required. "Clone" feature for speedy changes to batches of transmitters. It is often necessary to make the same change in functionality to a number of transmitters. The handy clone function eliminates the need to repeat the configuration changes in detail for each transmitter. PIN protection of sensitive functions ensures that malicious or untrained users cannot degrade alarm networks. The PINs are customer-specific and can be changed without reloading the software. However, this change must be performed by RDC's technical department.